The main difference between webinar and video conference is that webinar is a one-way communication that allows the presenter to speak to a remote audience with limited interactions with the audience while video conferencing is a two-way communication that allows transmitting video and audio simultaneously between multiple participants at different locations. The rapid development of Information Technology has improved lifestyles as well as businesses. Today, it is easier to communicate with many people around the globe at the same time using various technologies. Two such technologies are webinar and video conference. A webinar is also called a web-based seminar. It is a presentation, workshop, lecture, etc. that we can distribute to a large number of participants. Most webinar services offer live streaming options. It is possible to record the webinar and upload it into social media networks such as YouTube. The person who hosts the webinar (presenter) can connect to viewers around the globe using a strong internet connection. It allows him to present his ideas to the audience in real time. He can share his computer screen, and, PowerPoint slides with the participants. The participants can see and hear the presenter, but the presenter cannot see and hear the participants. Moreover, the participants cannot directly ask questions from the presenter. Instead, they can write their questions on the chat window. Video conference is a live connection between two or multiple participants in different locations of the world. It is necessary to send the audio and video both at the same time across the network to reach all participants. Therefore, everyone in the video conference must have equipment such as microphones, speakers, and, video cameras. It is also possible to share documents and other presentation materials among the participants. Nowadays, many companies are multinational, and they have branches located in different countries. These organizations use video conferences to conduct meetings. Therefore, the managers and other employees do not have to travel to participate in the conferences. Instead, they can communicate while staying at their original working places. Therefore, video conferences allow business organizations to conduct meetings in a cost-effective manner with minimum infrastructure. A webinar is a presentation, lecture, workshop or seminar that is transmitted over the web using a video conferencing software. Video conference, on the other hand, is a live, visual connection between two or more people residing in separate locations for the purpose of communication. 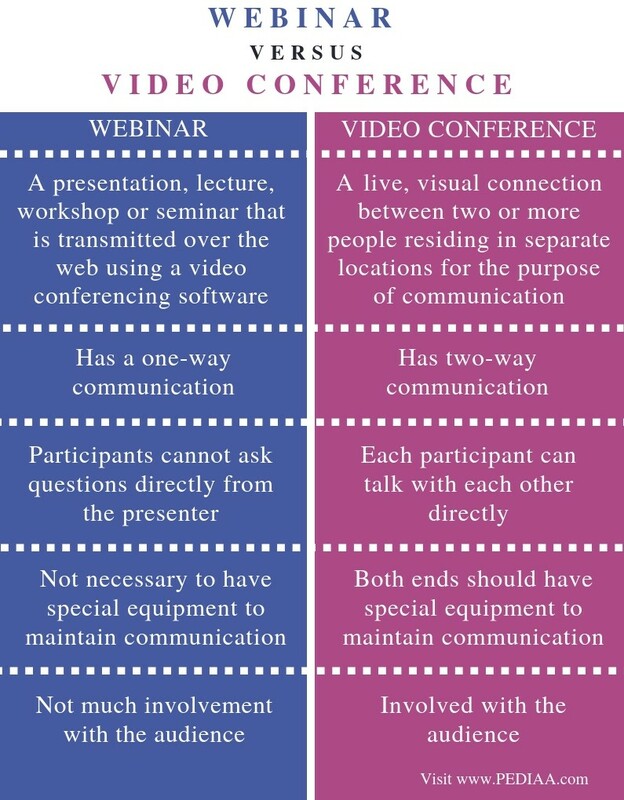 The main difference between webinar and video conference is that webinar has a one-way communication while a video conference has two-way communication. In a webinar, the participant cannot ask questions directly from the presenter. However, in a video conference, each participant can talk with each other directly. Technical requirement is another difference between webinar and video conference. In a webinar, it is not necessary to have special equipment to maintain communication whereas, in a video conference, both ends should have special equipment to maintain communication. Moreover, in a webinar, there is not much involvement with the audience like in a video conference. This is another difference between webinar and video conference. Webinar and video conference are two methods to communicate with multiple users. The main difference between webinar and video conference is that webinar is a one-way communication that allows the presenter to speak to a remote audience with limited interactions with the audience while Video conferencing is two-way communication that allows transmitting video and audio simultaneously between multiple participants at different locations. 1. Beal, Vangie. “Webinar (Web-Based Seminar).” Router vs Switch vs Hub: What’s the Difference? Webopedia, Available here. 2. “What Is Video Conference (Video Conferencing)? – Definition from WhatIs.com.” SearchUnifiedCommunications, Available here. 3. “What Is Video Conferencing? – Definition from Techopedia.” Techopedia.com, Available here.